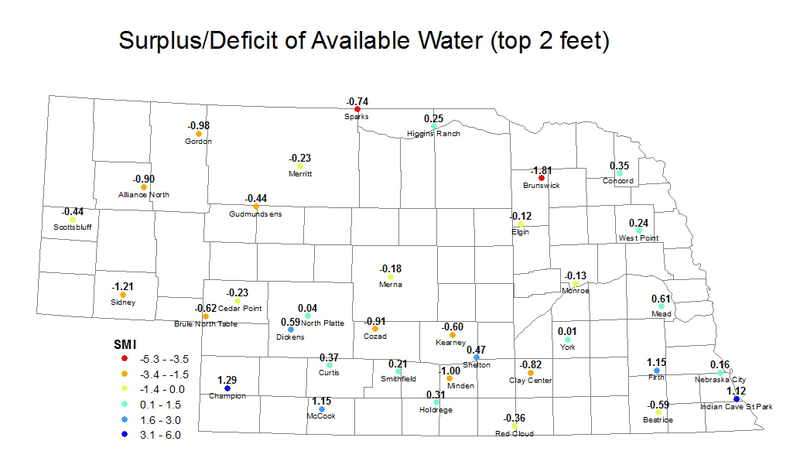 *Last week's report did not include data from Nebraska City and Indian Cave State Park. ** The Soil Moisture Index (SMI) is based on the estimated field capacity and wilting point at three depths (10 cm, 25 cm, 50 cm) at Automated Weather Data Network (AWDN) sites under grass cover. The index may not necessarily be representative of conditions of a nearby field, particularly if differences in total precipitation over the previous week have been significant. The past week was perhaps the driest of the season, as many locations did not receive any measurable precipitation between Monday morning (Aug. 10) and midnight on Sunday (Aug. 16). Thus, the gains in moisture from the previous week were mostly offset by last week's dry and seasonably warm weather at most sites in the state. Those areas receiving precipitation Thursday night and Sunday generally were in the Highway 83 corridor and in the far western Panhandle. 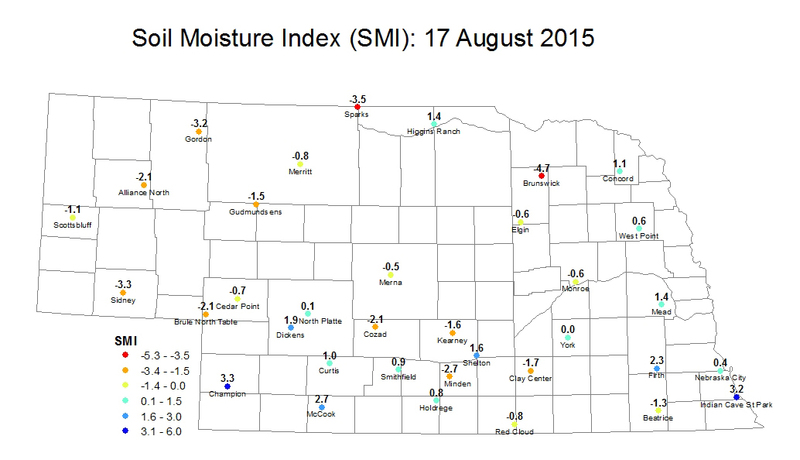 Much of southwest Nebraska is now on the positive side of the neutral (i.e., 0.0) soil moisture index (SMI) line and Smithfield, in south central Nebraska, climbed back into positive territory for the first time since the end of June. Many places in the state have already received a soaking rain today and the forecast is for more precipitation tomorrow. The rain combined with cooler than average temperatures should lead to a moister looking map next week.